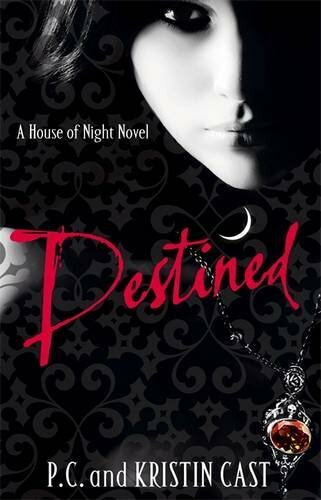 In Destined, the forces of Light and Dark collide as their epic struggle focuses on Tulsa's House of Night. Zoey is home where she belongs, safe with her Guardian Warrior, Stark, by her side and preparing to face off against Neferet. Kalona has released his hold on Rephaim, and, through Nyx's gift of a human form, he and Stevie Rae are finally able to be together if Rephaim can truly walk the path of the Goddess and stay free of his father's shadow. But is Zoey really safe? Does she truly know those who are closest to her? And will love win when it is tested by the very soul of Darkness? Find out what s destined in the next thrilling chapter of the House of Night series. Some people say this series is getting old. Wrongo... the battle is just beginning and in other words I adored this book. I have been with zoey and her vampyre crew from the beginning and I am with her to the end of the most fantabulous series and terrific book. I meant come one, P.C. and Kristin Cast are so generous! They just keep giving amazing books, and this one lived up the the rest. In fact I only have one bone to pick with them. Cliffhangers and whole years between new books... not a good combo. This book was better than all of it predecessors. Stunning, I think is the correct use of words. The casts have mastered the art of twists and turns cause this plot is chaotic! It keeps you hooked and engaged at all times. They casts have entwined the magical world of vampyres and the house of night with a darker gothic side to the ParaNormance genre and made this spectacular novel. I am particularly fond of Shaylin this time round and can not wait to see what she has in store for us all. The writing in these books is so lovely to read because it changes from character to character which only gives a deeper understanding to them. The dialogue is absolutely brilliant. Not Many teen authors are brave enough to use the type of dialogue that casts do but i love it! Nothing wrong with a little dirty talk or cussing, right? The characters are pretty much the same with the exception of one or two new characters or a minor character becoming a major (thanatos) but otherwise pretty much the same. The favorite character still stands as Zoey and Stevie Rae, who would rock a lesbian imprint and cause a lot of tension between heath/aurox, nefret, kalona, rephiam and stark so that would be pretty cool. I really did love this novel so so so much and you know, I can not wait a year for Hidden.